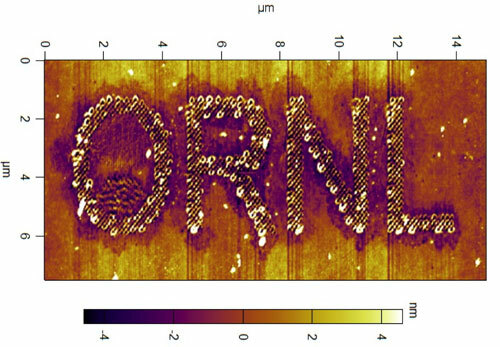 Oak Ridge National Laboratory researchers used atomic force microscopy to draw nanoscale patterns in a polymerized ionic liquid. Polymerized ionic liquids have potential applications in technologies such as lithium batteries, transistors and solar cells because of their high ionic conductivity and unique structure. But many aspects of the recently discovered materials are still not well understood. When ORNL researchers used an atomic force microscope to begin characterizing the properties of polymerized ionic liquid thin films, the experiment yielded some surprising results. Nanolithography is the dominant technique used by industry for nanofabrication, but its size limitations are leading researchers to explore other methods such as AFM. Similar AFM techniques have been used to study and produce patterns in nonconductive polymers, but the ORNL study uncovered several differences in the application to polymerized ionic liquids. “In comparison to nonconductive polymers, we have to apply less bias — four volts instead of 20 volts — to generate the holes, which is good in terms of energy savings for future applications,” Bocharova said. In nonconductive polymers, the high voltage applied through the AFM tip punctures the material’s surface by localized heating. In contrast, the ORNL team used experiment and theory to determine that the holes formed in the conductive polymer liquids resulted from negative ions migrating to the positively charged microscope tip. The researchers plan to continue refining the technique’s capabilities and their understanding of the polymerized ionic liquids’ properties.